Who doesn’t know Brutus?! No Introductions needed! This Brutus Buckeye charm will be a happy addition to any piece of jewelry...scarlet and grey preferred of course. This silver plated, hand colored bead is 100% made in the USA. That’s right folks, you are supporting American workers. 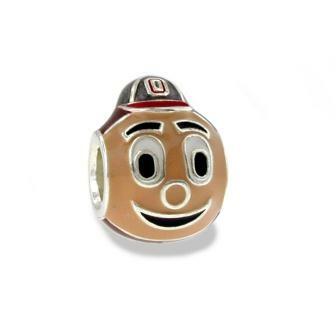 The Ohio State Brutus Buckeye bead is a perfect piece for any bracelet or necklace. This unique Ohio State charm can be arranged to make an exciting necklace, bracelet or anklet. And of course, this bead is officially licensed through The Ohio State University.